Then U.S. President George H.W. 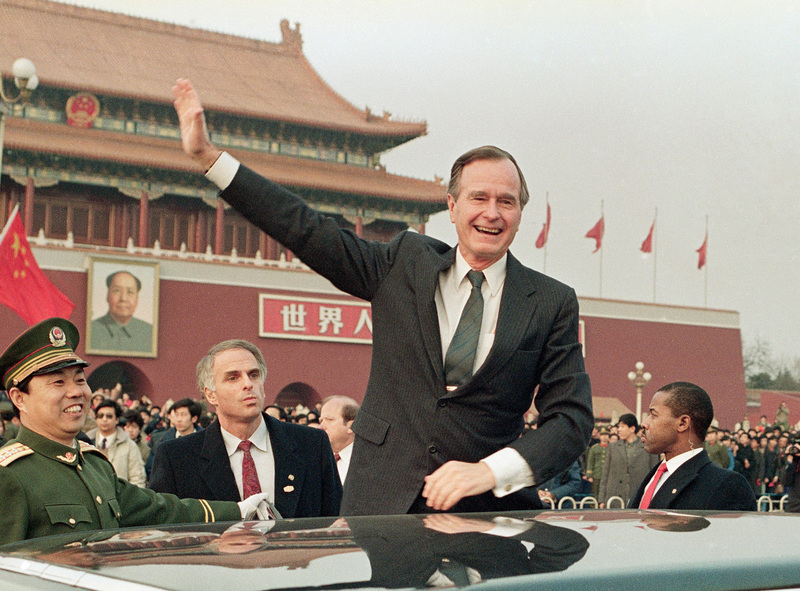 Bush waves from his car to the crowds at Tiananman Square in Beijing, February 25, 1989. George H.W. Bush deserves much of the praise he is getting for his conduct of American foreign policy, particularly towards Europe and the Middle East. But when it came to China, Bush simply got it wrong. He misjudged in advance what would happen to the Tiananmen Square protests and then mishandled the aftermath. Bush’s ideas and assumptions about America’s relationship with China were forged during his short stint as head of the U.S. liaison office there from 1974 to 1975. In the late Mao years, China was a deeply controlled, repressive country. Bush never saw firsthand the movement for change that gradually began to gather in China over the decade following Mao’s death—both within Chinese society and, importantly, within the ranks of the Party. James Lilley, U.S. Ambassador to Beijing during the 1989 Tiananmen protests, later recalled that Bush had underestimated what was happening and that he thought the crisis might have a peaceful outcome. According to Lilley, who was an old friend of Bush, the president was under the misimpression that violence could be avoided because Deng Xiaoping was fully in charge of the country and always knew how to make things come out well. It is now commonly said that after the crackdown of June 4, Bush’s policy sought to preserve America’s relationship with China. That shorthand obscures a more complex question: with which “China”? Not with Chinese society as a whole, but with the Party. And not even with the official Chinese Communist Party (C.C.P.) leadership of the time, headed by General Secretary Zhao Ziyang. (A rump meeting of the Politburo later deposed Zhao.) Back then, the United States found countless ways to show sympathy for reform elements (and dissidents) in the Soviet Union—but not in China. It is wrong to think of Bush’s policy as simply a “hands-off” approach to China’s internal politics. He gave scant recognition either to the people in the streets or to the reformers at the highest levels of the Party. He “saved” America’s relationship, but primarily with the old guard within the C.C.P. The rest of “China” was repressed, and with a few ups and downs, it has remained so. In the months after the crackdown, Bush disingenuously said he was cutting off all high-level contacts with Beijing, but then secretly sent his national security advisor, Brent Scowcroft, for talks there. In this way, he communicated to the post-Tiananmen leadership that American rhetorical condemnations of China’s violence were not to be taken as seriously as they seemed. In retrospect, this post-Tiananmen period was a crucial time when the United States held considerably more leverage in dealing with China than it possessed later on. Above all, Bush was trying to maintain the old American relationship with the Chinese leadership forged in the Nixon era. He couldn’t. At the height of the Tiananmen crisis, Bush tried to call Deng to urge restraint. Deng wouldn’t come to the phone. It turned out that, sadly, China was not what he had thought or hoped it was. My deepest impression of President George H.W. Bush came from his 1989 visit to China. At a banquet, he made sure to invite Fang Lizhi and his wife, who were then China’s most famous political dissidents. That decision clearly demonstrated the United States’ position on improving China’s human rights and pushing forward democratization. At that time, I was only a freshman at Peking University, but I still felt heartened by America’s position. It was completely in line with our previous understanding of American foreign policy: that it possessed moral responsibility—it had to spread democratic values to the whole world. This was the great tradition established by President Woodrow Wilson, and President Bush’s action in this case embodied that tradition. Soon afterwards came the June 4 Tiananmen Massacre, which shocked the world. In response to pictures of the “tank man,” Bush told reporters he was moved. He later also decided to accept Fang and his wife as political asylees. This moved me even more. To me, the United States’ understanding and support of the Chinese people’s pursuit of democracy was the real basis of friendly Sino-U.S. relations. In that historic moment, Bush’s strategic decision clearly made visible the contours of America’s righteousness. However, Bush also decided that Tiananmen should not interrupt Sino-U.S. relations. Thus he secretly sent special envoy Brent Scowcroft to Beijing to meet with China’s leader Deng Xiaoping, and, with shocking speed, the economic sanctions that had been levied against China were lifted. This is what made it possible for the Chinese Communist Party to get through the crisis of international isolation it had been suffering. While I completely understand Bush’s policy decision in this case, what I feel more acutely is regret. This one decision by Bush established a China policy framework for his successors: China’s economic development and opening to the outside world will inevitably lead China towards democratization; in order to promote China’s economic development and opening, the United States must maintain good relations with China and minimize confrontation; and, in order to maintain these good relations, it is necessary to reduce the importance of human rights issues in the overall relationship. I understand Bush’s decision, because many people at that time—myself included—harbored this kind of fantasy. But now, many people have realized that it is nothing more than a fantasy. China’s economic development and opening to the outside world do not necessarily lead to political progress. George H.W. Bush shared China in a unique way with another Republican President, Herbert Hoover. Both sojourned in China for extended periods and then, on the long road to the White House, spent their political careers in various senior capacities. But while both men used their China experiences to brandish foreign policy credentials, further comparisons highlight the differences three-quarters of a century can have in geopolitics. Hoover’s China, as he experienced it in 1899 Tianjin, was at the crumbling end of the Qing Dynasty where he prospected as a successful mining engineer—and had to be rescued by U.S. Marines in the Boxer Rebellion. By 1974, when President Gerald Ford asked George H.W. Bush to head up the new Liaison Office in Beijing, China had become unified under the Communist Party and was slowly beginning to reengage with the world. Although Herbert and Lou Hoover reportedly spoke Mandarin—at times resorting to the language when they wished to speak in code in the White House—it is hard to fathom Qing officials agreeing that Hoover be considered a “friend” of China in the same way that Communist leaders view Bush today. Throughout his professional career, Bush remained connected to China and its leaders. For one prominent Chinese official—who sat one spot down from President Xi Jinping at the G20 in Buenos Aires—this friendship cemented his career: Yang Jiechi parlayed his Bush family relationship to the commanding heights of the Politburo. But beyond the career advancement of a single Chinese diplomat, what the historical record shows is that in the Oval Office Bush was a realist who wanted to maintain personal ties to the Chinese leadership even as his energies shifted to focus on the historic events in Europe that ended the Cold War. That commitment seemed to engender genuine affection. Bush’s February 1989 visit to Asia, put together around the funeral of Japanese Emperor Hirohito, included a return to Beijing to demonstrate his personal engagement to further advance U.S.-China relations as President. In May that same year, National People’s Congress Chairman Wan Li visited the White House and, according to a declassified U.S. government memo, extended “friendly greetings” from Chinese leaders Deng Xiaoping, Zhao Ziyang, Li Peng, Yang Shangkun, and Li Xiannian. After the formal meeting, a smaller group moved over to the residence to discuss the public demonstrations erupting in several Chinese cities. On June 4, following a split among that very leadership, People’s Liberation Army tanks rolled into Tiananmen Square and the Communist Party began a nationwide crackdown. A month later, Bush dispatched National Security Advisor Brent Scowcroft on a secret mission to Beijing to express the U.S. position on the crackdown and keep lines of communication open. On a return visit in December, this time announced while he was in Beijing, Scowcroft laid the groundwork for the resumption of bilateral ties that Bush believed was in the interests of people on both sides of the Pacific.